Nearly 40 years after the last American troops left Vietnam, MTSU students who were born about 20 years after the end of the war went to Southeast Asia to discover a piece of the past and a glimpse of the future. 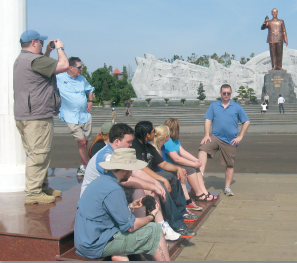 Public Memory and the Vietnam War is the name of the class, and it challenged students to compare what they had come to believe about the conflict from American books, movies, music, and TV shows with what they discovered after being in the country for two weeks. American troops; and boated across the Mekong River. They witnessed Vietnamese making rice paper, coconut candy, honey, and silk; sampled cuisine ranging from elephant fish to dragonfruit; inspected the ancient ruins of the Cham Kingdom; entered a cave that was once a Viet Cong hospital but now is a room of worship inside Marble Mountain; and viewed a pagoda that is reputed to enhance fertility. Wandering through official tourist attractions such as the War Remnants Museum in Ho Chi Minh City (formerly Saigon) provoked a great deal of thought about the nature and language of propaganda. Yet, unexpected moments that were off the itinerary reminded students that the need for human connection trumps both warfare and time. While preparing to leave the site of the 1968 77-day siege at Khe Sanh, a bus of North Vietnamese army veterans pulled up. The NVA vets, clad in green uniforms and wearing medals, immediately were greeted with smiles and handshakes from Vietnam Battlefield Tours guides, American veterans all. By far the most poignant moment was when MTSU alumnus William “Bud” Morris (’68, ’75) returned to within 1,000 yards of Quang Tri, one of the bases where he was stationed while in the Army during the war. The complicated relationship between the United States and Vietnam is as tangled as the vegetation that covers the southern hillsides of both countries. It practically cries out for a study-abroad experience of this nature: a chance to see, smell, taste, touch, and hear history and to get a sense of what life is like after the 1995 normalization of relations. MTSU can be proud to have provided that opportunity. Jim Bouton, former Major League pitcher and author of the widely discussed and debated baseball diary Ball Four , was the guest luncheon speaker at the 18th Annual Conference on Baseball in Literature and Culture in April. Chaz Bono, LGBT rights advocate, author, and musician, was the keynote speaker in April for MT Lambda’s SpringOut! 2013 celebration, a weeklong campus pride event for lesbian, gay, bisexual, and transgender students, friends, and supporters. The Capital University of Physical Education and Sports of Beijing, China, demonstrated Chinese kung fu at Murphy Center in April. 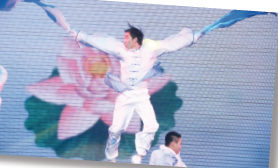 The event was presented by MTSU’s Confucius Institute. Among the performers was Fengmei Li, a stuntwoman who was the choreographer for Zhang Ziyi, who starred in the movie Crouching Tiger, Hidden Dragon. As part of MTSU’s observance of National Women’s History Month in April, Rep. Beth Harwell of Nashville, speaker of the Tennessee House of Representatives and the first female House speaker in Tennessee and in the Southeast, was honored as the second Distinguished Friend of the University Honors College. Lilly Ledbetter, whose judicial battle with the Goodyear Tire and Rubber Co. led to the passage of federal legislation in a historic gender discrimination case, was the keynote speaker for MTSU’s biennial Women’s and Gender Studies Conference in April, a major part of the University’s National Women’s History Month celebration. Ken Paulson, a nationally recognized advocate for the First Amendment, is the new dean of the College of Mass Communication. Paulson, president and CEO of the First Amendment Center at Vanderbilt University and at the Newseum in Washington, D.C., replaces Roy Moore, who had been dean since 2008. Paulson was on the team of journalists that founded USA Today in 1982, and he was editor-in-chief from 2004 to 2009. He is now a columnist on USA Today ’s board of contributors. Paulson is active in the Nashville music community, including as vice chair of the Nashville Songwriters Hall of Fame. He is also the author of Freedom Sings , a multimedia stage show celebrating the First Amendment that tours the nation’s campuses. David J. Urban is the new dean of the Jennings A. Jones College of Business. Formerly executive associate dean and marketing professor in the School of Business at Virginia Commonwealth University, he replaces Jim Burton, who was dean for 13 years. Urban will guide a business program that boasts more than 125 full-time faculty members, more than 3,000 undergraduate majors, and more than 500 graduate students. MTSU graduate Beverly Keel (’88), an award-winning music journalist and former recording industry executive, is now chair of the Department of Recording Industry. A longtime MTSU professor, Keel returned to the University after serving as senior vice president of media and artist relations for Universal Music Group Nashville, where she developed extensive media campaigns for a charttopping roster including Lionel Richie, Scotty McCreery, Sugarland, Jamey Johnson, Josh Turner, Kip Moore, and many more. 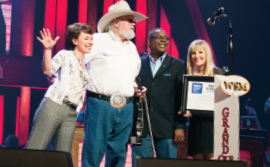 (L. to R.) Pam Matthews, executive director of the International Entertainment Buyers Association, MTSU President Sidney A. McPhee, country music star Charlie Daniels, and MTSU recording industry student Jordan Todd. MTSU President Sidney A. McPhee surprised country music legend Charlie Daniels on the stage of the Grand Ole Opry in May when he helped announce that the International Entertainment Buyers Association had established a scholarship in honor of Daniels with a $25,000 endowment. The IEBA is a Nashville-based, nonprofit trade organization for live entertainment industry professionals. 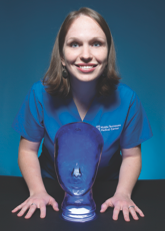 Starting in the fall of 2014, a $1,000 scholarship will be awarded each year. Students majoring in recording industry, songwriting, audio engineering, and music business are eligible recipients. In April, six journalists made up the inaugural induction class of the new Tennessee Journalism Hall of Fame housed at MTSU. Heading the group was John Seigenthaler, chair emeritus of The Tennessean , founding editorial director of USA Today , and founder of the First Amendment Center at Vanderbilt. Also honored were Dan Miller (posthumously), the longtime chief news anchor at Nashville’s WSMV-TV Channel 4; William Bryant (Bill) Williams Jr., a third-generation community newspaper publisher and publisher emeritus of the Paris (Tenn.) Post-Intelligencer ; Anne Holt, a 30- year veteran and three-time Emmy Award winner at WKRN-TV News 2 in Nashville; Chris Clark, retired chief news anchor for WTVF-TV NewsChannel 5 in Nashville (and current instructor at MTSU); and Dean Stone, editor of the Daily Times in Maryville. In April, MTSU officially acquired the Middle Tennessee Medical Center property near campus. The 17.4-acre property includes the 115,000-square-foot Bell Street Building, a 143,000-square-foot parking garage, and a large green-space area that was the site of the old main hospital building. President Sidney A. McPhee has said that the University will use the Bell Street Building for academic purposes. 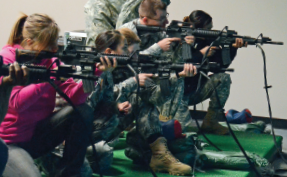 MTSU ROTC cadets now have more opportunities to sharpen their shooting and tactical skills following an upgrade at the Military Science Department’s indoor rifle range simulator. MTSU provided funding for an additional five-lane, $116,000 trainer unit, bringing to 10 the number of lanes available at the Engagement Skills Trainer. The simulator uses computers, lasers, projectors, and pneumatic weapons to provide a realistic experience of firing a weapon, including recoil and sound. MTSU’s delegation to China in May yielded several new agreements with strong potential to produce tech transfer opportunities for the University’s science-related endeavors. First, MTSU’s partnership in China studying modern uses of ancient herbal remedies has produced almost 40 results showing promise in the treatment of cancer, viral infections, and other ailments. Those findings were released during a visit to the Guangxi Botanical Garden of Medicinal Plants, named in2011 as the world’s largest medicinal herb garden by Guinness World Records. Located in Nanning in southern China, the garden features more than 7,400 medicinal plants. Xu Xuyan, deputy director of the Education Bureau of Shunde District, MTSU President Sidney A. McPhee, Senator Bill Ketron. Guangxi garden are partners in an exclusive collaborative agreement that seeks to accelerate the development of Western medicines from plant extracts. MTSU’s delegation was headed by McPhee and included state senate majority caucus chair Bill Ketron, R-Murfreesboro, a 1976 graduate of the University. MTSU established formal ties with a university known as “China’s MIT” for its strong science, engineering, and biomedical programs. 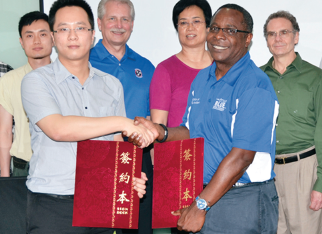 The agreement between MTSU and Shanghai Jiao Tong University will allow the exchange of faculty and students and allow professors to collaborate and share research. Shanghai Jiao Tong University, founded in 1896, offers three disciplines—naval architecture and ocean engineering, mechanical engineering, and clinical medicine—that are ranked first in China. Additionally, MTSU signed a pact to become the first American university to establish formal ties with an institute in China’s leading design center for household appliances and technology—the Research Institute of Industrial Design in the Shunde district. MTSU also opened a student recruitment office at Guangxi University— the University’s first overseas representative office—as part of its efforts to bolster international enrollment in master’s and doctoral study. The delegation also made stops at Chongqing University of Posts and Telecommunications (one of the country’s top universities for information science and technology), Communication University of China in Beijing (the country’s foremost media education university), and the Confucius Institute’s global headquarters, which oversees more than 350 institutes worldwide (including at MTSU). the 55th annual Grammy Awards in 2013, winning recognition for Carrie Underwood’s “Blown Away” to join his earlier wins for Lady Antebellum’s “Need You Now” and Underwood’s “Before He Cheats.” Kear competed against fellow MTSU alumnus Eric Paslay’s (’05) “Even If It Breaks Your Heart,” performed by the Eli Young Band, in the Song of the Year category. Alumnus Torrance Esmond (’03), a.k.a. “Street Symphony,” who is vice president of A&R at Reach Records and a songwriter and record producer, produced Gravity with gospel rapper Lecrae, which won the Grammy for Best Gospel Album. MTSU faculty and alumni have appeared regularly on Grammy nominee and winner lists in recent years. 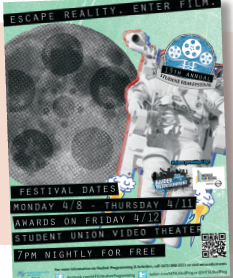 Some of MTSU’s finest student filmmakers showcased their work at the 13th Annual MTSU Student Film Festival in April. David Perauldt won first prize for Do It All Call. The audience favorite went to Ryan Rhenbourg for Hobo Wicked Fix. Nashville-area filmmaker Christopher Roberts screened his documentary Street Paper, which is about Nashville’s successful newspaper sold by homeless citizens, the Contributor. When MTSU was recently named by the Chronicle of Higher Education as a top producer of Fulbright scholars for 2012–13, it joined academic powerhouses like Duke, Stanford, and Princeton. Just 108 colleges were recognized, and no other college or university in Tennessee was listed. MTSU students have received Fulbright funding to teach or do research in a variety of fields—from philosophy to biology to international relations—in countries as diverse as Portugal, Russia, Tanzania, and Laos. MTSU has produced nine Fulbright winners since 2001. Sponsored by the U.S. Department of State, the Fulbright is one of the nation’s most prestigious scholarships and its flagship international educational exchange program. Recent grad, Kaitlen Howell (on left), recently spent 18 months in Germany conducting epidemiological research as a Fulbright scholar. Eight MTSU undergraduate student researchers participated in the seventh annual Posters at the Capitol in February in Nashville. They included Goldwater Scholar Award recipient Jordan Dodson. Created in 2007, this year’s Posters at the Capitol brought 64 undergraduate researchers from six Tennessee Board of Regents and three University of Tennessee universities to the state capitol to meet and discuss their research with state senators and representatives. Other MTSU students who participated included Adam Banach, Jacob Basham, Matt Harris, Josh Horvath, Joseph Keasler, Kevin McDaniel, and Paige Stubbs. MTSU students Robert Daniel Murphy (winner) and Jonathan W. Herlan (honorable mention) received recognition in the Barry Goldwater Scholarship and Excellence in Education Program. Murphy’s goal is to get his Ph.D. in atomic physics and research exotic states of matter such as Bose-Einstein condensates and degenerate Fermi gases. 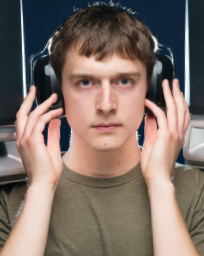 Herlan seeks a Ph.D. in physical acoustics and wants to conduct acoustic research and teach at the university level. 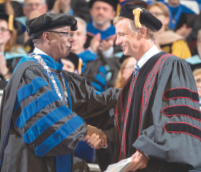 At a time when lawmakers are stressing retention and graduation in higher education in Tennessee, MTSU’s May commencement ceremonies witnessed the largest graduating class ever. The ceremonies were highlighted by speeches from Gov. Bill Haslam and alumnus Pete Fisher (’87), general manager of the Grand Ole Opry. An MTSU construction management team had another top-10 finish at this year’s national competition in Las Vegas. Led by Jason Harrison, the six-member MTSU Land Development/Residential Building Construction Management team placed eighth out of 31 teams at the International Builders Show. MTSU, which won in 2007 and 2012, has nine top-10 and seven top-5 finishes. In this year’s competition, students were given 118 acres, including an existing rock quarry, to develop on the banks of Utah Lake in Saratoga Springs, Utah. Collage: A Journal of Creative Expression earned a Collegiate Gold Crown Award from the Columbia Scholastic Press Association for the second straight year. It was the journal’s third major award in the past three years. Senior Courtney Hunter and alumna Jennifer Johnson served respectively as editor-in-chief and designer of the award-winning issues. In the recent contest, 1,344 digital, print, and hybrid magazines, newspapers, and yearbooks published during the 2011–12 academic year were eligible. 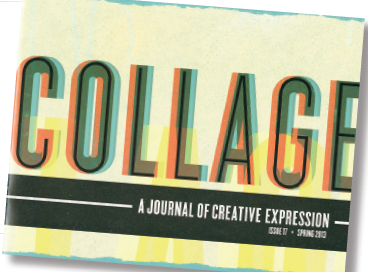 Only three college print magazines received Gold Crown Awards. The organization called Fashion and Design Students of MTSU, known as FaDs, displayed their talents at several places on campus during MTSU’s second annual Fashion Week in April. American costumer Manuel, often called the “Rhinestone Rembrandt,” whose original designs have been worn by Johnny Cash, Elvis Presley, Bob Dylan, Hank Williams, the Rolling Stones, and the Grateful Dead, was a featured speaker.